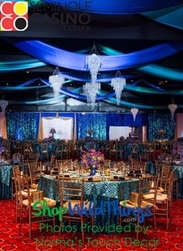 Browse hundreds of ideas at ShopWildThings for using purple as your special event theme. 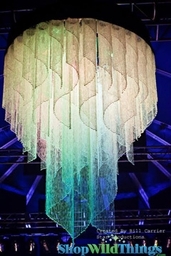 We're the industry leader when it comes to colorful finds and lighting for top event planners, movie productions, stage sets and television shows. 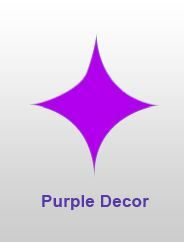 Choose violet iridescent or purple non-iridescent beaded curtains for hallways or backdrops. Create a memorable layout with our jazzy pearls bead curtains in blue and purple or flirty lilac string curtain collections at ShopWildThings. Coordinate these beaded purple curtains with our chandeliers, hanging lamps and strand lighting for dramatic effects at ballroom galas or celebrations in outdoors settings. Decorate an indoor or outside reception with purple nylon parasols and sparkly purple striped organza chair bows and table runners. 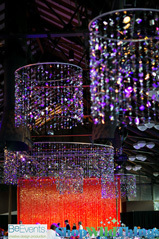 Overhead, hang our purple spangles chandelier or rows of string lights and purple paper lanterns. Flowering Wisteria Tree � Fuchsia & Violet � 11.8 Feet Tall x 8.6 Feet Wide "Sideswept" � Create Arch Using 2! Parasol - Purple Nylon - 20" x 32"
COMING SOON! Folding Fan - Fuchsia Pink Nylon & Wood - 8 1/4" x 14"
1 LOT AVAILABLE! CLEARANCE Purple Glitter Rope - Double Sided - 5 Yards - 72 Pcs! SALE ! Mercury Glass Candle Holders - Round "Leslie" Purple - Set of 12 - 3" x 3"
Acrylic Rhinestone Stickers-Lavender- Strips with 260 Pcs! For home décor, give your bedroom a regal look with beautiful purple netting bed canopies. 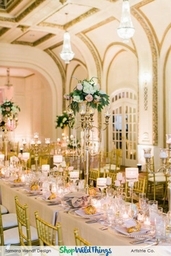 Our fairy tale bed canopy sets with flower garlands include coordinating bead curtain sets and chandeliers. Our Hampton purple ceramic garden stools make lovely bedroom or living room accent tables or elegant ottomans. 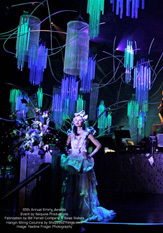 Decorate a show set or evening cocktail party with our LED blossom tree with 16 changing colors. 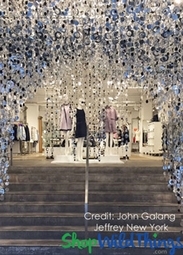 We have feathered LED light strands and double-sided purple glitter rope. Create a tropical look for summer parties or seaside weddings with purple Capiz shell strands. At sunset, for a unique touch, just switch on some battery-operated LED candles that have been placed inside our violet glass candleholders.